Social media has gotten to the point where it shapes our lives and makes a great impact on it, so every now and then we get wowed with a new update that is meant to keep up with our needs and demands. Few hours ago, the Facebook-owned Instagram, launched its long-form video hub, called IGTV, which will be part of the Explore tab that shows photos and videos a user might be interested in. The hub will feature vlogs that are around 10 minutes long, up from the previous one-minute limit. Videos will range from 15 seconds up to 60 minutes. The file size for a video will be a maximum of 3.6 GB, which is more than enough for even very high-quality clips. Days before rolling out the new long-form video hub, Instagram met with online content creators and encouraged them to record 10-minute long videos. Those content creators have the responsibility to set the standards and style for the hub, which IGTV creators of the future will have to follow. Instagram will directly take on the competition with YouTube if the new hub turns out to be successful. Videos will have link-out options so that creators can earn money from the IGTV hub. These options will allow creators to drive traffic to their own stores, or websites. By this, it is clear that Instagram is planning to offer monetisation (converting the assets into sources of revenue) in the near future, but has not yet revealed its working. Instagram is spending its efforts around celebrities who developed their popularity on the web through mobile, rather than focusing on traditional ones. Those creators, who already have large Instagram audiences, are given the opportunity to set the norms for the hub, as they are already skilled in this style of storytelling content. The videos will be full-screen and vertically oriented similar to Snapchat, with a resolution that can be set up to 4K. Users watching the videos will get the recommendation of recent popular videos, and will get the option to continue watching videos they didn’t get to finish. The new IGTV hub could be a place creators want to be in to get more exposure and popularity, rather than just monetisation. This is merely because of the growth trajectory of Instagram over time, were its adding approximately 100 million users every fourth months, and its announcement of 800 million users in September 2017. The IGTV hub could create a new behavior pattern in users. Its launch is also important for Facebook, which lacks a popular video destination source. IGTV videos start playing automatically as soon as you open the app. It will automatically pull content from people you already follow, so there’s no need to hunt for videos you might enjoy. But you can discover something new by swiping up to switch to another video or choose from one of four sections: “For You,” “Following,” “Continue Watching,” and “Popular”. 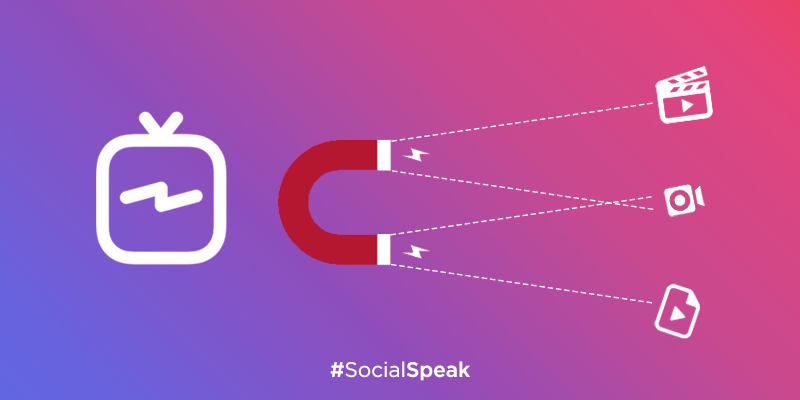 Stay tuned to #SocialSpeak to stay up to date and see the impact of IGTV in the future. LinkedIn Taking its Professional Discussions to the Streets! SocialSpeak: Are we Ready for a Unified Inbox?